June is the time of year to get fresh, locally grown strawberries in New York State. They are so delicious and sweet, especially after a long, cold winter. Spring greens and asparagus are also available at roadside stands and farmers markets. 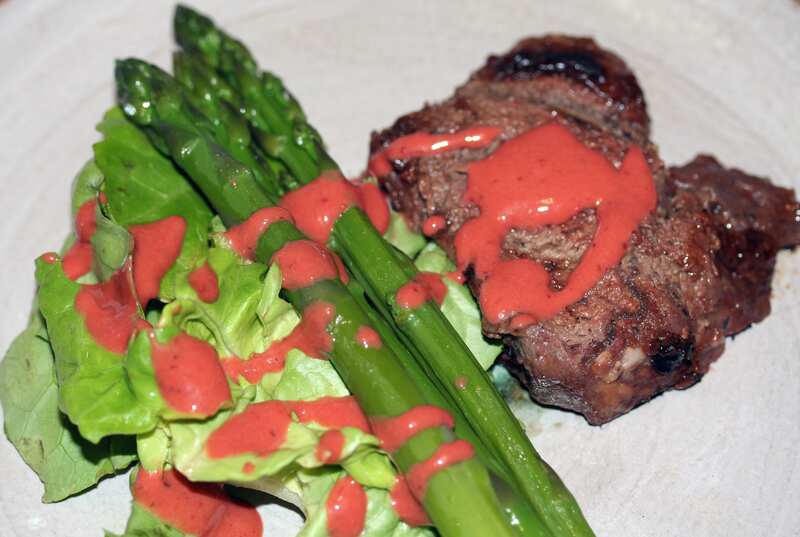 So if you want a spring treat, dig into your freezer, pull out a packet of venison chops or steaks, marinate them in a teriyaki sauce, grill them to a perfect medium rare, and serve them alongside a salad of spring greens and asparagus with a strawberry balsamic dressing. Eat outside and enjoy. To maximize flavor of the strawberries, place on a foil lined baking sheet with sides turned up to catch any juices and bake them in a 400 degree preheated oven until caramelized (optional step). Place all ingredients in a blender or use an immersion blender and blend until smooth and emulsified. Keep refrigerated until ready to use. Use within a few days or freeze to use later. Notes: this dressing is delicious on a salad of spring greens or drizzled over lightly cooked asparagus. It also tastes great drizzled over roasted or grilled wild fowl, fish or venison .